The rainbow diet approach to healthy eating is a refreshing perspective. If you find colorful foods appealing, choosing this diet is an easy and satisfying way to improve your health. The rainbow diet begins, as with any healthy eating program, with a solid foundation of proper hydration. Drinking enough water daily to stay fully hydrated is essential and will enable you to get the maximum nutrient value from your food. Even though there are several important nutritional principles involved with any healthy eating program, one of the most important universal recommendations is to consume a rainbow assortment of fruits and vegetables on a daily basis. From a nutritional standpoint, there are five key color groups of fruits and vegetables—red, orange, yellow or light green, dark green, and blue or purple. 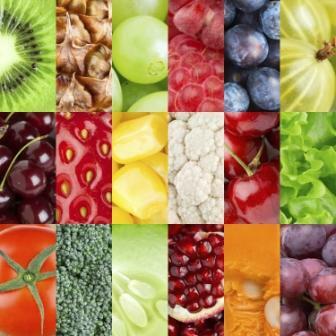 A rainbow assortment of fruits and vegetables will give your body the full spectrum of compounds and nutrients it needs to fight off disease and build immunity. In fact, some experts believe that cancer and other diseases are caused by a “maladaptation” to insufficient intake of fruits and vegetables over a period of time. Some of the most important nutrients from fruits and vegetables are antioxidants, such as vitamin C, E, zinc and selenium. Colorful fruits and vegetables also contain phytochemicals, which include pigments (such as chlorophyll, flavonoids, and carotenes), as well as the all-important food enzymes, dietary fiber, and other disease-fighting compounds. I don’t believe that grains are a necessary part of a healthful diet, especially if you are eating animal-based protein or if you are overweight. However, if you prefer to add grains to your diet, whole unrefined, high-fiber grains are the best option, and preferably gluten-free. In general, most people are going to be much better off eating at least twice as many vegetables as fruits. Fruits have high sugar content and many people already have blood-sugar issues. Thus, I generally recommend 6 to 8 daily servings of vegetables and just 2 to 4 servings of fruit. However, this ratio will vary from person to person, based on your health condition, climate, culture and activity levels. A serving size is equivalent to ½ cup of raw finger vegetables, ½ cup cooked vegetables, 1 cup of leafy green vegetables (raw or steamed), 1 medium fruit, or ½ cup of small fruit (such as berries) or ½ cup of cut-up fruit. When you shop, look for the most colorful fruits and vegetables and buy one or two from each of the 5 color groups. After washing your vegetables with a produce cleanser (highly recommended), cut up a variety of multi-colored raw vegetables for snacking, such as celery, carrots, cucumbers, red and yellow peppers, and radishes. Keep your fruits and vegetables in the cooler bin in your refrigerator so that they stay fresh longer. First eat the fruits and vegetables that expire the quickest, such as asparagus, bananas, peaches and nectarines. For healthy snacking, pack raw vegetables and/or fruit in a soft-sided thermos to take with you to work or wherever you are going. Eating raw vegetables along with some form of protein or healthy-fat dip—such as guacamole, hummus, pesto, or almond butter—will make them much more satisfying and tasty. A quick and refreshing way to get several servings of raw fruits and vegetables at once is by juicing them, either in a high-speed blender or juicer. Eat at least one large salad daily, choosing a mix of leafy greens, herbs, and/or fresh sprouts. I never get tired of my daily salads because I always add variety and color appeal with two or more of the following: red peppers, tomatoes, green or purple cabbage, cucumber, celery, blue or purple berries, green or black olives, yellow or orange sweet peppers, and carrots. Keep a fruit bowl on your dinner table or kitchen counter for easy access to a quick, healthy snack. ﻿In summary, the rainbow diet is a healthy eating program that focuses on choosing at least one or two fruits and vegetables from each of the five key color groups—red, orange, yellow or light green, dark green, and blue or purple. These colorful plant-based foods provide essential nutrients, including phytochemicals, antioxidants, enzymes, fiber and disease-fighting compounds.